The weak ruble is leading to a reduction in the population's purchasing power and an increase in the number of Russians living below the poverty line. The fall of the ruble is leading to a reduction of the population's purchasing power, according to the Russian Ministry of Economic Development. In the last two months the ruble has lost almost 50 percent of its value against the U.S. dollar and the euro. As a result, according to the ministry, the number of people in poverty (those whose income is below subsistence level) will reach a four-year high of 11.7 percent in 2014. "With the weakening of the ruble many people are trying to protect themselves from the devaluation of the currency by buying rather expensive durable goods, especially if they are expensive and have no Russian equivalents," says Alexei Kozlov, chief analyst at UFS IC. "Thus we are witnessing a growth of purchasing activity." However, according to Kozlov, this is a temporary phenomenon and the weakening of the ruble has a whole range of negative consequences, such as the growth of inflation, the contraction of the consumer market, and an increase in the credit rate, which leads to the deceleration of economic growth, and so on. Moreover, surveys show that Russians are already spending most of their money on food and prefer to limit their travel to trips within the country. "The consumer sector is under a lot of pressure and the standard of living is decreasing," says Finam Management analyst Maxim Klyagin. "Consumers have reduced their spending on capital purchases, such as apartments, cars, but also on non-essential goods and services." According to Klyagin, in September, for the first time since the 2008-2009 crisis, a one-percent year-on-year decrease in real wages was registered. And according to the Russian Federal State Statistics Service, the first half-year results show that the year-on-year dynamics of retail sales on the whole have fallen from 3.9 to 2.7 percent. Klyagin is convinced that the end-of-year results will show that growth has been minimal in the last five years since 2009. With this in mind, delays on credit payments have also increased. According to data published by the Central Bank on Dec. 3, as of Nov. 1, 2014 the share of 90-day delays on credit payments from residents and non-resident reached 7.9 percent. A similar indicator was registered on February 1, 2011. The bank's official announcement says that the growth in arrears is related to the deterioration of the population's financial situation, which is often due to delays in salary payment, a decrease in income and the loss of jobs. And most credits are indicated in rubles. According to Fitch Ratings, at the end of September, 17 percent of all bank credits were in foreign currencies and almost all credits were corporate. 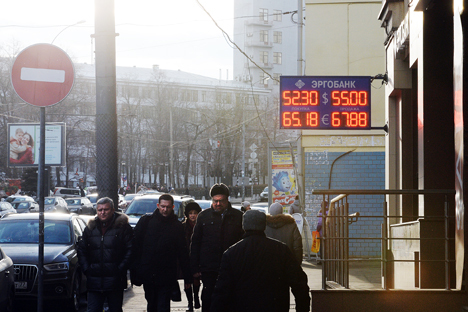 Despite the fall of the ruble and the growth of discontent, the population prefers to keep its savings in rubles. According to a survey held by the All-Russian Center of Public Opinion Study, 65 percent of Russians are following the exchange rate and 53 percent are worried about the weakening of the ruble. However, only seven percent of Russians have exchanged rubles for foreign currencies in the last two months. In turn, according to another statistics institute, the Levada Center, 80 percent of those surveyed said that prices in the country are growing while the standard of living is falling. They say that the main reason for the decline in the economy is the fall of oil prices (45 percent), Western sanctions against Russia (33 percent) and the annexation of Crimea (30 percent). According to the Romir (the largest private independent research company in Russia) survey, the share of respondents who are economizing and refraining from buying certain foods has increased from 8 to 20 percent. Moreover, one out of three households is being forced to redistribute their budget in favor of buying food and the most essential items. VTB Capital predicts that the share of expenses for food among Russians may rise from 31 to 40 percent. Dmitry Bedenkov, director of the analytical department at Russ-Invest, says that "trust in the national currency is an important element in the investment process, which stabilizes the economy and guarantees a normal production cycle and the functioning of market mechanisms." Meanwhile, according to data from the Federal Tourism Agency, the number of Russians going on vacation within the country due to the sanctions and the fall of the ruble has already increased by 30 percent.